The SV May Queen is Australia’s oldest sail trading vessel and is one of only a handful of wooden vessels of her era still afloat in the world. 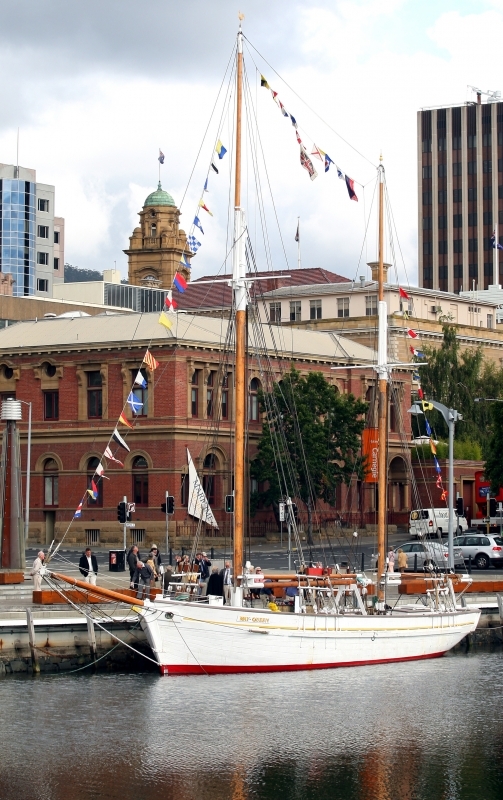 Built at Franklin on the banks of the Huon River in Tasmania’s south in 1867, her working life spanned a century of development, with the changing nature of her work and the cargos she carried reflecting the changes and growth of the communities she served. Fitted with a retractable centreboard, the SV May Queen is 21 metres long, 5.3 metres wide and has a draft of 1.5 metres when fully laden with 25,000 super feet of sawn timber (50 tonnes). Her hull is of Tasmanian blue gum and stringy bark, her deck is of Tasmanian Celery top pine and her spars are of imported oregon. SV May Queen is moored on display in Constitution Dock. She can be viewed from the dockside and is usually open for inspection on Saturday mornings and Thursday afternoons. SV May Queen's life is explored on the following pages.